“It started out as a hobby; I never intended to make money. But I love this job. It’s lots of fun.” This is how Tommy Dee from Pattaya’s Fabulous FM103 summed up his experience in the radio business. 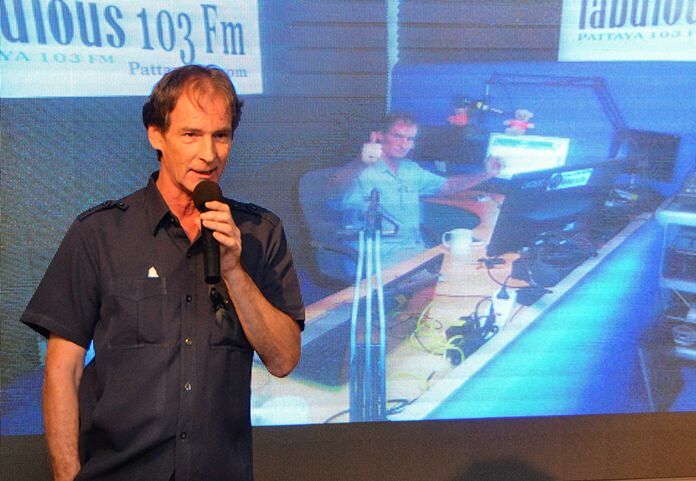 Tommy, who opens up Fab FM 103’s daily lineup every week day with a breakfast show from 9am-1pm, was the guest speaker at the Pattaya City Expats Club’s November 27 meeting. 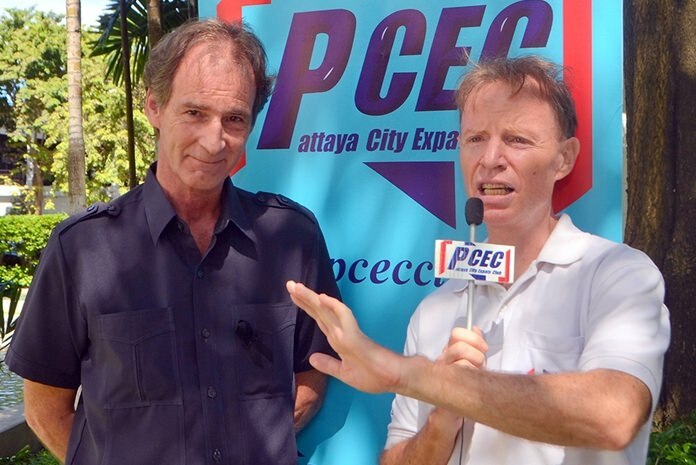 Member Ira Wettenstein conducts the PCEC’s Open Forum which follows the speaker’s presentation; a time where members of the audience can ask questions or provide comments about expat living in Pattaya. Tommy related the interesting story of how Fab103FM was born in his tiny office at home, and how it has grown into a company with a state-of-the-art studio system and worldwide programming, and which has recently branched into TV and newspaper. Four years ago, after Tommy had fallen out with a previous business partner on another station, he was offered a job by the lady running 103FM. The equipment consisted of a 300 baht computer, a 200 baht mixer, headphones and the world’s worst microphone. “It was like radio 30 years ago,” said Tommy. They upgraded their equipment, rebranded the station “Fabulous FM103,” and before long were the third most popular radio station in Pattaya, after MIX and Pattaya People. “We started getting advertisers, and that’s what pays for radio,” said Tommy. “We were doing ok until the Army decided to take over.” Further Tommy said that for a year afterward no money was coming in. In addition, the government required radio stations to have licenses. Before that, he said, “licensing was a joke.” That’s why there were so many radio stations; but most of them weren’t licensed. According to Tommy, the Army also instituted many regulations that made the business very expensive. MIX couldn’t afford it, and Fab103 took over their studios. He says it’s a great location, a four-story building at the highest point in Pattaya with a big antenna on the roof. The only problem was that they had to get retro-active approval for the building and everything in it. They had to take the antenna off of the roof, get one of only two structural engineers in Pattaya to approve it, and then put it back on the roof. Then every piece of equipment had to go to Bangkok to get approved. This was an expensive and lengthy process. After Tommy Dee’s presentation to the PCEC, Ren Lexander delves further with an interview which can be viewed at https://www.youtube.com/watch?v=yj80HuzvU-0&t=131s. He said sometimes the station goes off the air because of an electricity surge. They have surge protectors, but the computer is programmed to shut down if the surge reaches a certain level because if the computer is destroyed, they’re not allowed to fix it; the computer has an Army seal on it that they’re not allowed to break, so they must send it to Bangkok to be fixed. Tommy said that under Thai law, they must hire four Thai people for every foreign presenter that they hire locally. But they discovered a system where anyone anywhere in the world can get on the air. So now, they have programs from many other countries. BBC asked FAB103 to be their partner in this part of the world, so now the station carries live BBC news, being read in England, with only a one second time delay. They have to give the Army their schedule. Every station must run Thai news at 5 pm, and the Thai royal news from 8 – 9 pm. “We stick to the rules,” said Tommy. 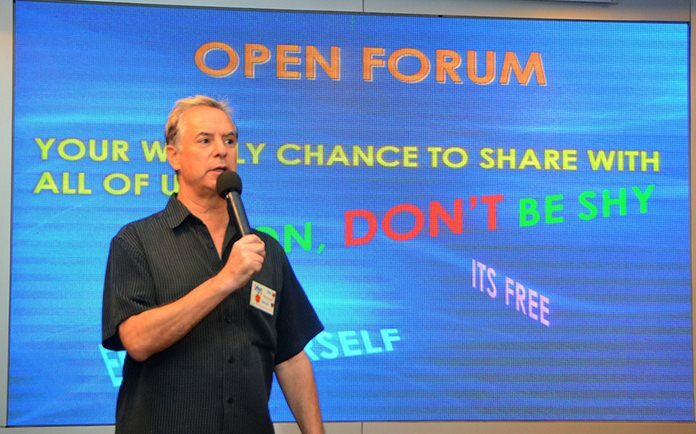 Tommy Dee explains how he started out with his radio career in Pattaya as more a hobby than a means to make money and how much he loves the radio business. Every day at 5 am they get the police reports to update the news, but Tommy said they really enjoy getting the word about something good, instead of all the negative news that usually dominates the media. “There is a good side to Pattaya, and it seems to be evolving and becoming a vibrant city,” said Tommy. Tommy said this year he was asked to set up a TV station. At first, he said “no” because the same programs are repeated week after week on TV. But after meeting the TV staff, “kids” in their 30s, who had been bashed by other TV stations and told to just follow orders, he saw how talented and professional they are, and said yes. Tommy ended by showing a video that the TV “kids” have put together of the recent Memorial Ceremony on Pattaya Beach Road: held to honor the memory of Thailand’s beloved late King. “There were 120,000 people at the memorial service, and you could hear a pin drop,” said Tommy. The video showed clips of the emotional ceremony, interspersed with videos of the late King, all with the haunting strains of flute music in the background. It is a very moving video and can be viewed at https://www.facebook.com/TvPattaya/videos/250960478653242/. For more information visit their websites at http://pattaya103.com/fab103/ (you can listen to the radio station on this website) and www.tvpattaya.com. After the presentation, MC Ren Lexander brought everyone up to date on upcoming events and was followed with the Open Forum where questions are asked and answered about Expat living in Thailand, especially Pattaya.